The Diamond Story™ is a unique bridal engagement collection, celebrating your choice of an engagement ring with one-of-a-kind characteristics. Each step in the diamond-finishing and jewelry-making process is captured and documented, so you will know why there is no other ring like yours in the world. When each bride wears her engagement ring for the first time, The Diamond Story becomes her own – to cherish, tell and re-tell many times. The Diamond Story captures the unique essence of the ring you have chosen. You will appreciate this story the first time you try on your ring. You will live this story each time you admire your diamond’s fire, brilliance and scintillation. Of all loving relationships in the world, yours with your chosen partner is unique. Of all engagement rings in the world, yours also is unique. The Diamond Story captures this remarkable story. Each rough diamond contains an inner luminous essence, revealed through the intricate process of diamond cutting. 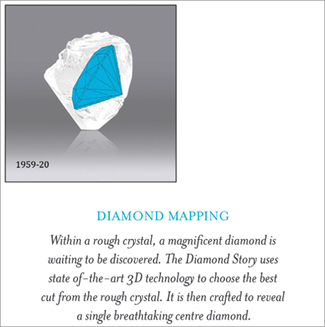 Our process uses state of-the-art 3D technology to map the best cut and character for each rough diamond. 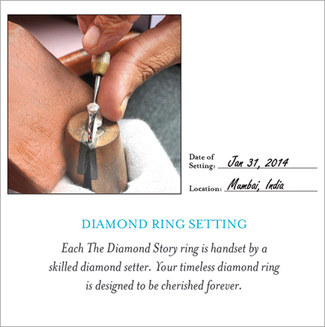 Your certificate includes an image, showing how Diamond Mapping unlocked the essential beauty of your center stone. 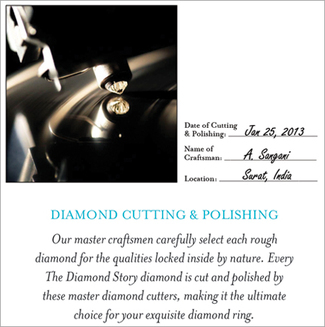 Down through generations, diamond cutting and polishing has been the noble art of master craftsmen. Today, skilled human eyes and hands still make the precise cuts required to capture the sparkle and beauty of brilliant round diamonds. Your rough diamond has been enhanced into an exquisite engagement ring by industry-leading cutting and polishing specialists. The Diamond Story diamonds are independently certified by the Gemological Science International (GSI) with grading that documents the 4 C’s: Cut, Clarity, Color and Carat Weight. 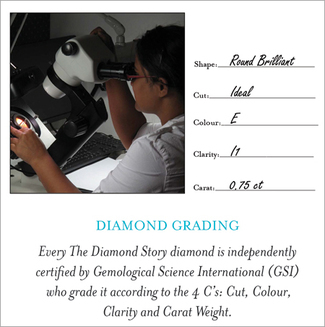 The diamond’s quality is guaranteed by the GSI certificate that accompanies each ring. Each diamond is microscopically etched with a unique ID number to ensure a high level of quality and permanent identification. Our styles are timeless, blending the essence of romance with modern design expertise to enhance your diamond’s natural beauty. 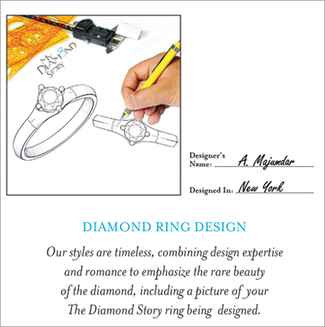 The Diamond Story includes an artist’s sketch of its setting, to help you appreciate the designer’s vision as your jewelry was conceived. As part of the personal touch that is The Diamond Story’s essence, each ring is handset by a skilled craftsman.This is the final step before your ring reaches your finger and becomes a part of you – an enduring symbol of your new life and relationship.